I'm not much of a fruit person. 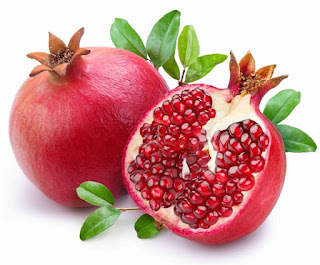 I like mangoes, water melons and papayas occasionally, but, these days, pomegranate has become my favorite fruit. The reason for this sudden change in my fruit preferences is that my haemoglobin levels have dipped again (they've gone below 8 this time) and I'm trying to raise them without having to take those daily iron pills that wreak complete havoc on your intestines! Besides, I'm not too sure those pills work that well either. I took them for more than 6 months straight last year, and look where I stand now! So, it's up to these pomegranates now, to restore balance in my circulatory system. Surprising thing is that I used to avoid pomegranates earlier at any cost, but now, I actually like them. I feel good after eating them or drinking pomegranate juice. I can understand now how Bella (from the Twilight series) relished drinking blood while she was pregnant with the vampire Edward's child! Apparently, our body automatically gets attracted towards whatever it needs. Anyway, what's your favorite fruit? This is my sixth post for KBL Jun 2015: My Favorites. Link to the previous post: My Favorite Things That Teachers Say. I haven't even heard of Ice Cream Works. Is there some other name for them too? I must ask the shop owner in my neighborhood. Would definitely like to try a Kairi-flavored ice cream! By the way, Twilight cover page also has apple on it! Ditto to Pommy ;) It's yummy fruit. I remember reading about this on your facebook page. Hope pomegranate has helped your condition. Btw, mine is grapes...I love those little juicy little gems! Leo, yeah it is good. Especially when the seeds are all crimson red. Princess, I'm not sure at the moment if it's any better or not. It did seem better for a while, but then I think the heat wave cause it to dip again. I'm feeling quite good today though. No light-headedness at all. Do you like green grapes or black ones? Mango is my fav. I find eating pomegranate a bit tedious, its juice is great though!